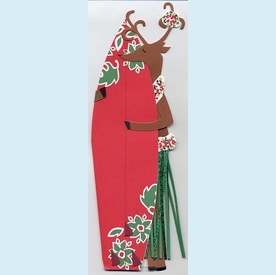 This adorable diecut and glittered hula girl reindeer stands up holding her red surfboard, which opens to reveal your printed party information! Fantasticly fabulous! Simply format text to fit the perforated surfboard shape on the insert and print, then fold along the perforation and punch out. The shape is then adhered inside the fold-out surfboard. Once assembled, the reindeer, has a fold-out easle backing so it actually stands up vertically! NOTE: Only 3 sets left! SIZE DIMENSIONS: ~3.5" x 9"